I made 2 quilt tops last week. LOVE those Kona solids! 2 is the number of lunch bags that my sister and I made last week. We talked about making these for 2 years before we actually got around to it. I love them! Each one could also double as a small purse or as a cute knitting project bag. 2 is also the number of times my sister quilted hers. Let's just say that free motion quilting did NOT go well for her. At all. It made for some good laughs, though. 2 days until I send my boys off to school. I have mixed feelings about it. I quilted 2 quilts on Saturday. Which means I have 2 quilts to bind. 2 is the number of hours I stayed up past my bedtime reading a great book. It's not all about quilting all the time around here, if you can believe it. Tomorrow I get to see my 2 cutie pie nephews. Yay! And 2 is the number of hours I plan on spending at the beach this afternoon. One last thing for today, although it has nothing to do with the number 2, I've been loving Pandora. Love, love, LOVE it! If you have kids, I highly recommend the Schoolhouse Rock station. It's so much fun. The kids and I are kind of addicted. Yes, all because my spiderweb quilt is finished! This quilt is about as close to an heirloom as I'll ever make, I would imagine. I generally love simple quilts, but I love the intricacy of this one. LOVE it! The quilting had me intimidated to no end. I thought it was going to be ridiculously hard because the quilt top itself didn't lay flat. Starting out at a deficit in that area isn't a good sign. Besides, some of the intersections have 8 layers of fabric in them. Just look at all those seams! So I basted this quilt heavily, using 9 or 10 pins in each block. In the end, the quilting went super duper smooth. It was amazing. I felt a little foolish because I was so intimidated by it for so long. I have grown to LOVE my walking foot in the process. Immensely. Here's a shot with the backing and binding. My local quilt shop owner did a fabulous job at picking out these fabrics. Fabulous! Do you wonder why I love her taste? Polka dots and stripes! They are the perfect compliment to the quilt top. Here is a shot of the back where the quilting lines form a star. What a fun little surprise! It measures 66" x 88", so a perfect twin size. I'm pleased as punch that it is done! You can bet that I'll be sleeping under this one tonight. My husband and his high school friend, Scott, have recently re-connected. They both are funny individually, but together they are HILARIOUS! It's like having my very own comedy show in my living room when they get together. I love it. Last weekend Scott came down to visit because he and my husband are in the process of getting a musical group together again. We got to talking and he requested a quilted guitar strap. At first I thought he was just putting me on, but he was actually serious. He said that the choices at the guitar store are pretty limited: skulls, leather with studs, etc. Certainly nothing that suits him. He bought a plain black strap, which I ripped apart and replaced with a quilted strap. It turned out pretty dandy, if you ask me! Getting it reassembled so the strap was adjustable again made my head hurt, but after a bit of time, I figured it out. All the fabric is all from repurposed shirts. We kept the tag on from the store just as a joke. Here it is on one of his guitars. He was excited. I love it. My husband has put in an order for 2 for himself. I've added them to my never ending list of things to make someday! I appreciate a small project like this because it's nearly instant gratification, unlike the plethora of unfinished quilts I am working on. I finally got around to playing with Tammy's scraps this week. It was great fun! I thought I would attempt to outline a bit of my design process along the way. The first thing I did when I got the scraps is to sort them by color. I always start by sorting by color. It gives me a sense of order, I guess. I waited a few days to let the ideas roll around in my head. My first thought was to make to a mini zig zag quilt using my no triangle method. I tried to think of other ideas, but I kept going back to the zig zag. I figured, "why not?" I made a bunch of squares, half white and half print. They are 3" unfinished. 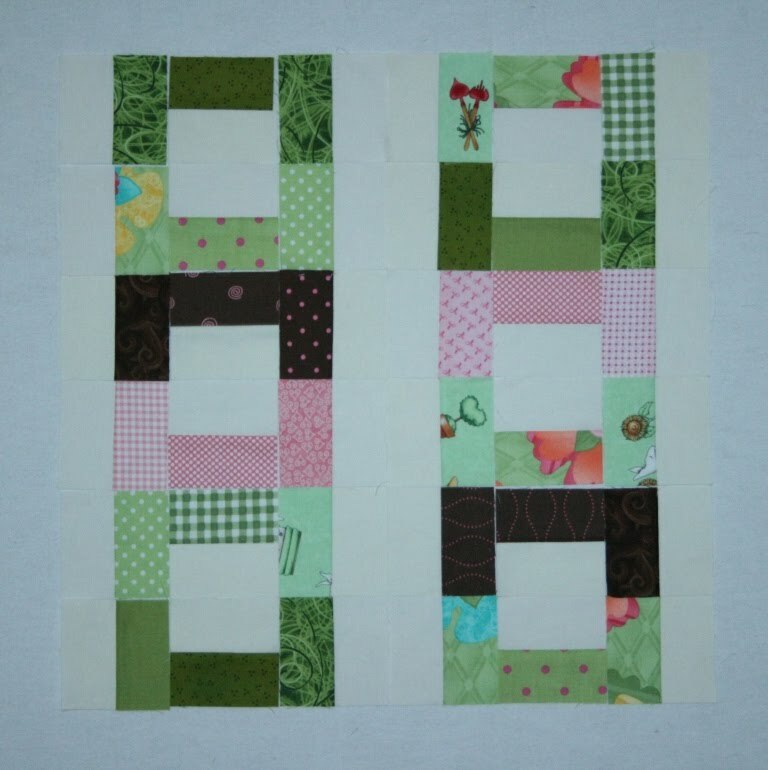 I ended up adding a few greens, a few pinks and some cream solid from my scraps to fill in the gaps. I arranged them in a zig zag formation. Boy, this little block has a LOT of potential. LOTS! I'm amazed. Then, I came up with this. But when I loaded it on my computer, it flipped the photo. I like it even better this way. I'm not sure which layout I'm going to use yet. Who knows, I still may come up with more? If you don't mind voting for your favorite, I'd love to have your feedback. I added a little poll button on the sidebar. Thank you all for sharing your opinions about my backing dilemma. I'm actually glad that the votes were so equally split. It made me feel so much better about my conundrum (in some odd way). I ended up taking the dilemma to my local quilt shop over the weekend. The owner, who has FABULOUS color sense, helped me decide. She immediately picked the quilt along quilt for the backing in question. Figures. Then I posed the question, "What on earth do I back the spiderweb quilt with?!?!" At this point it was urgent. I needed to have this issue put to rest. The first bolt she pulled out was this polka dot with just the right shade of cream background. It's from the Martinique line by 3 Sisters from Moda. It is PERFECT! She's a genius! (I could have hugged her right on the spot. But don't worry, I didn't.) She also picked out the stripe for the binding. It wasn't an immediate favorite, but I trust her judgement. I'm sure it will be better than anything I would have picked. Now I'm left wondering why on earth I didn't ask her a year ago! On a personal note: My sister had her (second) little boy early this morning. He is 6 weeks early! They are all doing as well as can be expected. He's breathing on his own already, which is amazing. He just needs to learn how to eat. (I'm sure I could give him a few pointers! hee hee) He still needs a name, too. He only weighs 4 lbs 8 oz. I can't wait to see him. When shopping for fabric, I find something I like, (preferably on sale) then I stock up for future quilts. Then, when I make my quilts, they are usually comprised of between 75% to 100% of stash. It is a process that works well for me. I like the challenge of using fabrics on hand and working them together like a puzzle to come up with a complete quilt. When I saw this fabric at Gruber's, I loved it. It was on sale ($4.50/yard!) and since it is smack dab in the middle my color comfort zone, I bought 5 yards of it, knowing it would make a lovely backing for some quilt someday. I put it together with my spiderweb quilt top and thought, "THIS IS IT!!" I like how the shapes of the backing fabric have angles that somewhat mimic the spiderweb shape. The colors are pretty close to what is in the front. Plus, it would camouflage my quilting lines. I even found binding fabric in my stash to match, because that is the last piece of the puzzle. It would look good, don't you think? This is where the indecision came in. I put the backing next to my quilt along quilt. Could there BE a better match? (said in my best Chandler voice.) I don't think so. This is what really gets me...for all the fabrics in the spiderweb quilt, you would think picking a backing would be easy peasy. Not so much. I've been struggling with what to back it with for a ridiculous length of time. About a year now, I guess. Help! When I was a little girl, I had a kitten that was black with white paws. Most people would have named it Socks, Boots, Mittens, you know, something along those lines. I called my kitten Whitey Paws. I'm blushing as I type this and wondering why on earth I'm telling you this. Unfortunately, my naming skills haven't gotten any better with time (which is why I'm thankful that Susan names most of my quilts) and my daughter seems to be following in my footsteps. (Poor short girl, LOL!!!) I knit up this new little friend yesterday. We should have named it before she could. It's a good thing he's cute. He's going to need all the help he can get with a name like that. Can you imagine how the kids at school are going to make fun of him? The cutie pattern is here. I'm planning on making a whole passel of yarn friends. They are a little fiddley, but soooooooo worth it! After lunch, I found Yarn Bear in the living room with little A's beloved blankie posed just like this. Isn't that so stinkin' adorable? I love it when my kids love what I make. They can't wait to each have one (or ten) of their own. They are smitten and so am I. For the arms and legs I cast on 7 stitches rather than 4. I knit 12 rows for the legs and 9 rows for the arms. I knit the body in the round on double pointed needles. Next time I plan to knit it flat and sew up the seams as directed in the pattern. Being a novice knitter I had a few problems with color changes and holes in the back. Sorry about the delay...I finally got around to picking winners for the squares giveaway. (I kept forgetting!) Char wins the Kona blocks and Shanley wins the green blocks. Thanks to everyone for playing along! 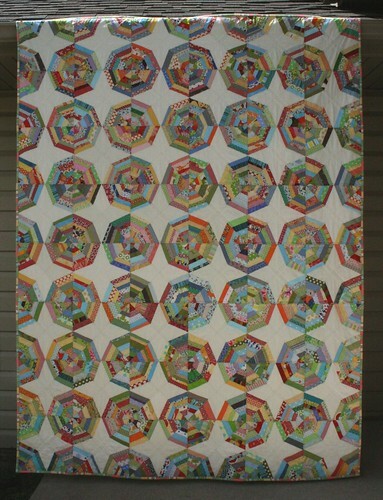 Welcome to week 10 of the quilt along. This is the last step! I'll be honest with you...this quilt was a lot more challenging than I expected. (It was a bear!) If I hadn't been hosting the quilt along, who knows how long this one would have been laying around, unfinished. This baby made me question my quilting abilities more than once. And that was just today. For this week, take the 4 pieced strips that are 32 segments long from last week's step, and lay them out along with the sashing strips that measure 64 1/2" as shown. (This is a shot of the top left hand side of the quilt.) Sew the strips on to the center part of the quilt. Repeat on the bottom of the quilt and you are done! Do a little happy dance and add your quilt to the flickr group. I can't complete this post without admitting that I ended up adding a few inches of white to my sashing strips and just chopped off the remaining ends that I didn't need. It was by far the best solution that I could think of given my problems with my pieced strips being too long. So my final quilt measures about 65" (or so) x 88 1/2". It will fit a twin bed nicely and that was the goal. 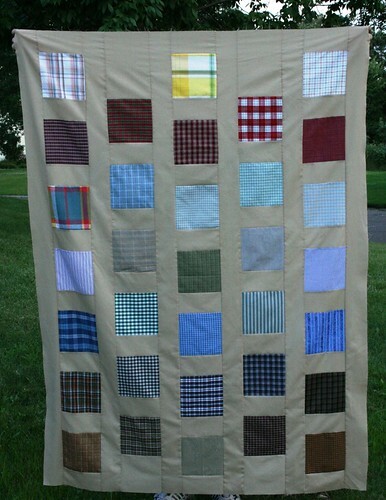 I'm sure that after time heals the pain, I will really love this quilt. LOL! To finish your quilt, you can check out my basting tutorial, one of my quilting tutorials and then my binding tutorial. Since I'm feeling the need to branch out from my stippling rut, I'm planning to quilt mine with diagonal lines, much like Diane did on her 9 patch quilt. Isn't that gorgeous? You can download the pdf here. Yay! I didn't include the cutting instructions on the pdf, so I am going to outline how to cut the sashing here. They are pretty slick and easy, if I do say so myself. First, cut your 2 yard piece of background fabric to 66 1/2". You will be making lengthwise cuts from the fabric. Lay out the fabric like it comes off the bolt. In this photo the fold is on the left, the selvage edges are on the right. Take the bottom of your fabric and fold it up onto itself. Line up the edges as much as possible. I tend to use the fold side to line it up. Now, take the fabric and fold it up onto itself once again. At this point the fabric should fit on your cutting mat. Make one cut that measures 6.5", and 4 cuts that measure 3.5". Discard the selvages (not shown on this photo, they were on the right) and the fold (on the left). Since the fabric is doubled, this will yield 2 6.5" strips and 8 3.5" strips. Now you are ready to make the rest of the cuts according to the pattern. Easy as pie, right? Since this is a free quilt pattern, if you make one for yourself, would you also consider making another (quilt top only) and donating it to Margaret's Hope Chest? They will quilt and bind it and then make sure that it gets into the hands of someone in need. Of course if you want to finish the quilt yourself and donate it, they would happily accept those as well. That kind of goes without saying, though, doesn't it? ;) Your donation will be much appreciated! One more thing...if anyone who was at the work party last weekend found an extra pair of orange handled Fiskars scissors with black blades, I lost mine. :( I know I could go out and buy a new pair, but those had sentimental meaning to me. If they turned up in anyone's stuff, please let me know. Thanks so much. 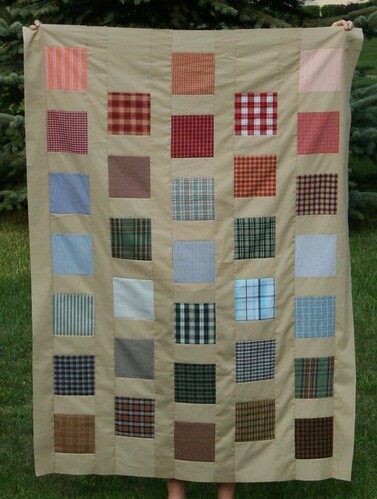 Here is the first version of the plaid quilt I made, again using the fair and square pattern. See that one orange square near the top? It was bugging me and I felt like it stuck out like a sore thumb. I had it hanging over my banister and every time I walked by, I wavered. Should I change it out or not? About 5 days later, I decided to sit down and do it. It didn't take me long at all, and phew! I'm so glad I did it. I was delighted when I read this post. Apparently I'm not the only one who struggles with things like this. So afterward, this is what it looks like. And here is the second plaid quilt top I made. Just today, actually. I just love these! As you can see, I like to keep the colors in order and I can't help myself from arranging the plaids as if they were shirts hanging in a closet. I'd like to say a big huge thank you to the following generous people who sent me plaid squares for this project: Terri, Janet, Angela, Thimbleanna, Sonia, Jenn, Libby, Sherry, Ms. Clayton, Debbie, Lucy, Donna, Erin, Carla, Bridget, Kristin, Cindy, Teresa, Sara, Ashley, Kelly, Anna, Timi (all the way from Hungary! ), Ann, Carol, Anita, Kathy, Tammie, Susan, Christina, Beryl, Jeannine, Barbara, Karen, Jocelyn and Yvonne. (I hope that's everyone.) THANK YOU SO MUCH! I couldn't have done it without you! edited to add: i'm not accepting any more plaids for this project. To answer many of your questions...I plan to post the tutorial here on my blog, so stay tuned! This is my 2nd sample of the fair and square quilt pattern. It's made up from all kona cottons except for the backing. For this round I used more-comfortable-to-me light sashing. It's kona ash, and it has been in my stash for awhile. I love it's subtle color and how it lets the darker colors shine. I used 5 pieced blocks in this version, which were made from jelly roll strips. I just love how flexible this quilt pattern is! 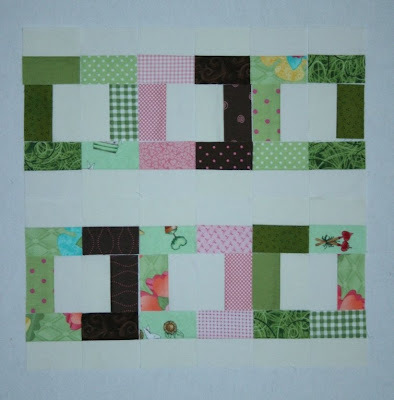 It uses 6.5" unfinished blocks, so any pieced block that finishes at 6" could be used. 9 patches would be fun. Or so would pinwheels! It's fascinating to me to see how much changing the colors and a few minor alterations really changes the look and feel of a quilt. That was part of the beauty of teaching this pattern at the work party-seeing so many different versions coming together in a few short hours. I could get used to that! 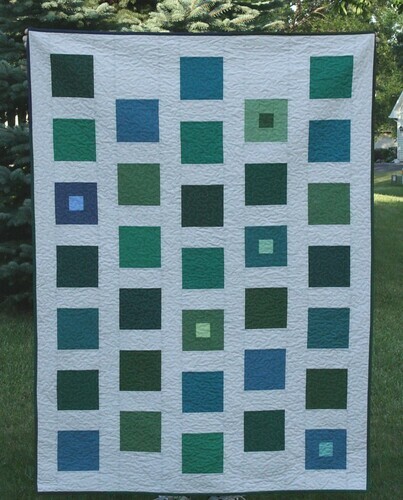 If you would like to win a packet of squares in similar colors along with the pattern to make this quilt for yourself, please leave me a comment. I'll pick a winner in a few days. US residents only this time please. This past weekend I spoke at the Margaret's Hope Chest Summer Work Party. I don't think I could ever grow tired of meeting new friends that share the love of quilting. I could, however, do without the 3 days of self doubts that plague me after teaching a class. :) But, I think it's safe to say that we all had a great time. And we got lots done! When Carin asked me to teach, we agreed that I would design a quilt for especially for MHC. She wanted it to be a man/boy friendly pattern around 45 x 65, something that was easy to chain piece and something without borders. This is what I came up with. I've made 3 quilt tops in this pattern so far and the variations/possibilities are endless. This version feels somewhat City Quilts-ish, wouldn't you say? I never thought I would make a quilt with black sashing, but this quilt made me want to run out and buy an entire bolt of black quilting cotton. It's fabulous! The various green fabrics came from a scrap box that Heather had given to Victoria, who in turn shared the scraps with those of us who were at the Gruber's retreat back in June. 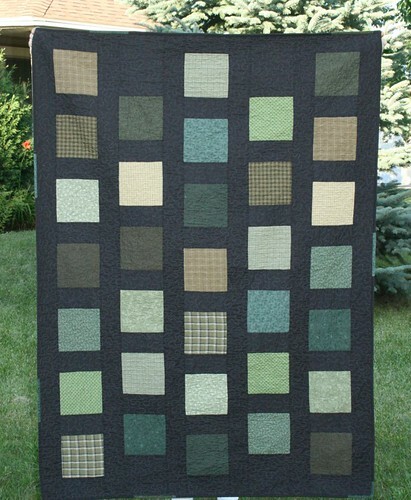 I knew I was going to be making masculine quilts, and the hunter green fabrics weren't so popular, so I thought I would challenge myself to try to make them work in some quilt somehow. I'm so pleased that I did it! I stippled the quilt in grey thread and as you can see, I used mostly black binding. I was so close to finishing the quilt, but didn't want to go buy more binding fabric, so I added a few green strips to make the black fabric stretch around the perimeter of the quilt. I chose the darkest green prints for minimal contrast. I love it when I can make do with what I have rather than buying more. Plus, it makes the final product so much more interesting. The quilt measures 48" x 66" and it was named by my 9 year old son. Welcome to week 9 of the quilt along! This morning I'm posting from Douglas, Michigan. Man, it's beautiful here! My family and I are wrapping up our summer vacation. We've been sleep depriving ourselves for a full week now. We are having a fabulous time! (Despite the lack of sleep.) Today we are headed to South Haven to enjoy some time on the beach before we head home. I'm glad I worked ahead a little on my quilt along last week so I could post this while I was on the road. Plus, I have a lot of other quilty goodness to share this week. Yay! For this week, all you need to do is to make 4 strip sets...each one is 32 segments long, so they should measure 64 1/2" when they are all sewn together. After all my issues with strips not fitting right, you can be sure that I'm going to be measuring them babies and getting them just right before sewing them to the quilt. It's funny how each quilt teaches you something, isn't it? For those of you who are quilting along, I'm curious, how are you doing on your quilt?